The following is the summary of a case study of a group of Lusitano horses that have been monitored over 4 years which were the subject of a masters thesis at the Faculty of Veterinary Medicine, Technical University, Lisbon completed in 2012. The study reports the findings from a stud where 11 foals developed flexural deformities of the front limbs, after they were born. (Acquired flexural deformity of the distal interphalangeal joint). In this stud farm, the owner has been breeding normal and physically sound horses since 2000. There were no changes in diet, exercise or any other significant alteration in management. 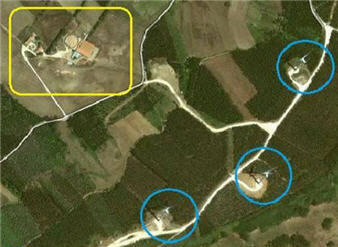 Until in 2008, wind turbines were installed adjacent to the property and grazing paddocks. 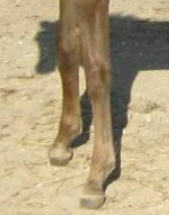 Since this date, a good number of foals and yearlings have developed deformities. -11 Lusitano horses. Age between 0 and 48 months old. -9 were born at the stud farm, 2 were acquired from a different breeder. The images show the same foal’s lower legs and hooves at 3 months (left) and later at 6 months (right) of age. Another foal was bought from another breeder to exclude a possible genetic link to this problem. 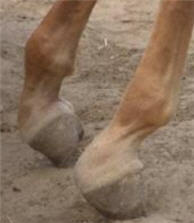 The pony came to the farm at 15 days old and, like the others, developed a flexural deformity. Measurements of ground vibration were made at different distances from the wind turbines, with the same equipment that is used to detect seismic vibrations (earthquakes). The results of these measurements, showed ground vibration at different frequencies. Research has shown that vibration effects bone metabolism. Cellular Mechano-transduction is the mechanism by which cells convert mechanical signals into biochemical responses. Based on the mechanical effects on cells it was proposed in this research project that the ground vibrations were responsible for a increased bone growth which was not accompanied by the muscle-tendon unit growth leading to the development of these flexural deformities. The above research project was based solely on this case study. Therefore, further research is necessary in order to validate these preliminary findings and hypothesis. Regarding the sound that the wind turbines produce, measurements were taken and studies have demonstrated some cellular damage is caused by low frequency noise. Since 2008, a high prevalence of front limb acquired flexural deformities was observed in a Lusitano stud farm. This work aims to evaluate this problem by reporting the results from tissue alterations in the affected animals as well as environmental conditions and management changes, which could have led to this observation. A total of eleven affected animals were studied. In these, a complete physical and orthopaedic examination were performed specifically the determination of the angle between the dorsal hoof wall and the floor. Radiographic examination, CT imaging, determination of the thickness of the cortical bone of the third metacarpian and histopathology of some tissues collected in biopsy and necropsy were done in a subset of affected foals. pasture away from the initial one and two others were admitted at the Faculty of Veterinary Medicine of Lisbon. In those animals, except for one that had to be euthanized for humane reasons, an improvement was observed on their condition, with partial recovery of the deformity. Histopathology was performed from (i) the tendon obtained by surgical desmotomy in one foal, (ii) tendon biopsies were performed in three foals and (iii) from the tissue of one foal during necropsy. Histologically the most significant alterations were the dissociation of myofibrils of the smooth muscle. This was predominantly seen in the small intestine but also in the walls of small capillary vessels, including those of the tendon vasculature. The flexural deformities have a complex and multifactorial etiopathogeny. They occur due to uncoupling of the longitudinal development of the bone and its adjacent soft tissues, but also from shortening of the tendon-muscle unit in response to pain. In the case series presented here, there was no obvious cause for the development of this problem, therefore we hypothesised that unusual environmental conditions might have played an important role in the development of this condition, especially those introduced in recent years.